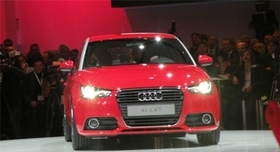 Sales of the new A1, pictured, may exceed a planned annual target of 100,000. BERLIN (Bloomberg) -- Volkswagen AG's Audi luxury unit is increasing production to meet higher demand for the A8 sedan and new A1 compact, Chief Finance Officer Axel Strotbek said. Audi is adding Saturday shifts at its plant in Neckarsulm, Germany, to meet demand for the new version of the A8, while sales of the new A1 may exceed a planned annual target of 100,000 vehicles, Strotbeck said. Audi has a goal of dethroning BMW AG as the world's largest maker of luxury cars by 2015. Strotbek reiterated a goal of exceeding 1 million deliveries in 2010, saying the level will be surpassed “not insignificantly.” Audi's sales in 2009 fell 5.4 percent to 949,729 units from 1 million in 2008. Audi will post “above-average growth” in results this year, Strotbek reiterated at a briefing in Berlin late yesterday. Audi will roll out as many as 12 models and upgrades in 2010, including a coupe dubbed the A7. The Chinese central bank's decision of June 19 to end the yuan's two-year-old peg to the dollar will provide a “small relief” to Audi's China-based joint venture, enabling the unit to import parts at lower costs, the CFO said.